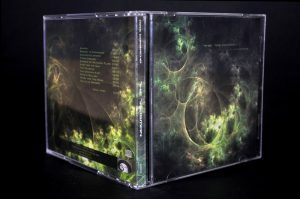 The Talisman is the 7th ambient atmospheric space CD from Max Corbacho. Eleven compositions created between 2004 and 2006, based on new, on the edge, harmonic and textural explorations. Intense, light, dark and purely atmospheric, most of these songs were composed during various, long, deep meditative improvisation sessions. ” In the planning stage, I have developed an intense activity in deeply programming new sounds in my habitual equipment, my beloved Korg Triton & Korg Z1, and sound processing outboard expansion units such Reverbs and Delays, as well some other esoteric gear. I have tried to create all the songs of this work “inside” my synthesizers exclusively, inside this deeply isolated world, an amniotic-like innerspace that develops in the synth and multieffects circuits, without insert any “external” element except for the voices in the first song. Also, I have experimented more and more with long, spacious reverbs and looping treatments “. Thus, the “oceanic” nature is strengthen, creating an atemporal quality, suspended in time and space, without rare elements disrupting the internal balance and natural flow of harmonic streams. No tempo, no synchronization, maybe only the breathing and the pulse of the artist. All fuelled by Max’s personal, emotional perception of life’s beauty.